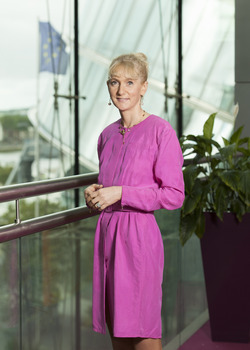 Alternatives investment specialist Olwyn Alexander juggles a diverse range of management and client relationship roles in her capacity as PwC Ireland’s EMEA Alternatives Leader. She also makes time to fit in her commitments as a board member of AIMA, the Hedge Fund Cares Ireland charity, and a mentor for the Women in Derivatives initiative. 5.20am: A force of habit from my days in NYC - early to rise. I check my emails for overnight activity from my US or Far Eastern colleagues. Given the global nature of the Asset Management industry and my European Alternatives leadership role there is always a number of messages to get the brain cells kicking into action! Our network in PwC is key, as clients demand and expect global responsiveness on a real time basis. On the cross trainer I check in with CNBC for how the markets have been behaving. This morning it’s ‘Larry Summer’s feeling Wintry’ after the recent market volatility! 7.00 am: Departure from home in Kildare, usually with the luxury of my driver (ok, my husband, John!) which allows me to do some catch up while he navigates the commuter traffic. 8.15 am: At my desk, this time is precious as once 9am hits it’s all go. This morning I’m reviewing a proposal for a potential expansion of our existing audit and tax services to a client. I meet with the partner leading the proposal effort to discuss our approach and share perspectives as to what the client wants and how we will deliver. 8.55am: A quick call home to say good morning to my two daughters, Alexandra (6) and Charlotte (4) and hear about their plans for the day - from pony camp to swim meets to Tayto Park! I am an avid horsewoman myself, and wish I could be at pony camp or riding my horse, Cara, but am quickly snapped back to work. 9.00am: We have an internal meeting with our Asset Management team where we take the opportunity to ‘get even smarter’ on a particular topic. Cyber security and the role of fund board directors is today’s agenda and we have our consulting and governance experts take us through the latest developments. 9.50am: I have a quick chat with our new Managing Partner, Feargal O’Rourke, who sits around the corner from me. Feargal is a tax partner by background, very focused on FDI into Ireland and has boundless energy and enthusiasm for our business which is infectious. I am very much enjoying my new role as Asset Management Cross Line of Service Leader for Ireland as it’s giving me an opportunity to be part of the overall PwC Ireland management team, and affords more interactive time with our people and top clients. 10.00am: I have a call with a UK based Fund manager to discuss the real assets’ funds they are planning to launch. We discuss the structures, their accounting framework and then get into the detail on valuation and custody of infrastructure assets from the Middle-East to Asia. 11.15am: Time to review board papers for an upcoming Alternative Investment Management Association (AIMA) Global Council Board meeting. I have been an elected board member of AIMA for three years now. It’s an honour to oversee the great body of work AIMA covers in both the regulatory and educational spaces, representing a very broad industry interest. 12.00pm: I take a call from a client on a new complex fund where they are ramping up the investment portfolio. There are some very unique aspects to what they are buying so we discuss the acquisition and their accounting and tax queries. As always they need a response asap so I discuss the issue with the manager, call Marie Coady, the tax partner, and we formalise our thoughts which we then run past our technical partner, Jonathan O’Connell. We have a real consultative and team approach in PwC, to ensure that we have considered all the angles and present the optimal solution to our clients. I get back to the client and they proceed with the transaction. 12.45pm: I meet the MD of one of our clients for lunch and we share perspectives on the market, our respective businesses and regulatory challenges both we and our clients are facing. I take him through some of the key observations from our new Alternatives Asset Management 2020 document and how we predict that the alternatives market will grow to $15.3 trillion by 2020. 2.15pm: Back at my desk, I meet with Karen, my PA, to go through travel arrangements for the coming months. Like many in the industry, I travel regularly as my clients are primarily based in the US and the UK and also due to my PwC European, Middle-East and Africa role. October to November will be busy with numerous trips to London and travel to New York, Barcelona and Milan, all focused on clients. 2.30pm: I have a quick meeting with one of our newly qualified accountants who is about to embark on the Chartered Financial Analyst (CFA) programme. I sit on the CFA Ireland Board and PwC is very focused on supporting our young talent. 2.45pm: I walk to the offices of a local law firm to attend the board meeting for a mutual client. In PwC we take our communications with those charged with governance very seriously. Having worked in New York, Dallas, Boston and the UK, over the years I’ve noted the variations in regulatory standards by fund domicile. I have been very impressed with the calibre of Irish boards and the high standards they set for themselves. We present our audit plan and approach for a group of funds and share some perspective on industry trends. We are finalising our Alternatives Benchmarking survey which gives managers and boards some insights into trends and some interesting stats on everything from valuation approaches to governance to expenses being charged. The Board and management are keenly interested in the findings we present - everyone loves to benchmark themselves! 4.00pm: I meet with one of my Women In Derivatives (WIND) mentees, who happens to be in Dublin for a few days. Based in NYC, she is a project manager for a large Private Equity house. I am mentor to this lady and another based in Washington and we speak every two months or so, meeting in person when we can. I pinch myself that I’m at the stage of my career where I’m now a mentor rather than a mentee! I really enjoy this interaction to give something back to the industry and to help two young women to think about their careers and how they might enhance their career paths, their CVs and further their opportunities. 5.00pm: I meet our AM head of transformation, Vincent MacMahon, at the coffee station and we discuss the latest in our technology advances for the audit process. PwC has invested $600 million globally on new technology tools. We discuss the pilots we are running including more data analytics supporting the audit process. We are very excited about bringing this new technology to market in the next few years. 5.15pm: I have a call with some of my fellow board members on Hedge Fund Cares Ireland about the roster of fund raising events and sponsorship levels. We have had a very successful year so far with the Casino night, the table quiz, our annual gala dinner in the Mansion House and a great day of golf at Carton House. I was a member of the grants committee last year and this allowed me to witness first hand some of the wonderful work certain Irish charities do to detect and prevent child abuse. We are always on the look out for new members and sponsors - all are welcome to this really great cause. The Irish chapter has been one of the most successful and ambitious launches and we are keen to keep the momentum going. 5.45pm: I visit a client’s office in Dublin to join my PwC international colleagues in a video conference to present a proposal to the client’s international team. We discuss the future of the industry, how key mega trends such as urbanisation, demographic changes, regulatory revolution and advances in technology are changing the Asset Management landscape, and drill down into what that means in the future for our clients’ business. PwC has made a significant investment in our Asset Management 2020 series - with Alternatives 2020 and ETFs 2020 recently issued, and Tax 2020 coming down the track soon it really allows us to engage with our clients on macro issues facing our industry. 7.00pm: Time to hit the road home and I can clear remaining emails and have a quick call with our global alternatives leader in the US, Mike Greenstein. 8.00pm: Home to my girls to hear about their day - they make me jealous and wish that I had been to pony camp too!